Spaceships, flying cars, and rocket boosters: these are the craziest designers in the history of the auto industry. It's one thing to build weird-looking custom cars (and giant ekranoplanes). It's another thing to build monstrous streamliners based on a maniacal obsession with organic forms. And it's another thing for these designs to actually work as extremely aerodynamic high-speed performance vehicles. That's the career of German industrial designer Luigi Colani for you. It's one thing to take on the collective might of the Big Three when they controlled nearly the entire American automotive market, but it's quite another to take them on with a helicopter-engined full-size sedan packed with innovative safety features. That's just Preston Tucker for you. Like Tucker, Stout was one crazy American who thought he could build a better car than anyone else in the established business. While Tucker's plans were a sort of engineering dead end, Stout's were crazy enough to work. That is, even if the world wasn't quite ready for them, as CBWoodward points out. Meet William Bushnell Stout. He designed what eventually became the Ford Trimotor. That's not quite important here though. While working for Packard, he left to start his own company, the Stout Motor Car Company. What did SMCC build? They built the world's first production minivan, the Scarab. Coolest minivan ever? Coolest minivan ever. The back had a table and middle row chairs that would turn around 180 degrees. Where did all this space come from? I'm glad you asked. They went with a unibody, rear engine design. The suspension? Independent coil spring, of course, at all four wheels. Who was inspired by this suspension design? Only a little-known guy named Colin Chapman. That's right. The Scarab inspired the Chapman Strut. The innovative engine/transmission layout on the Lamborghini Countach? INSPIRED BY THE SCARAB. You know how the Chrysler Airflow was a big deal with its whole, "aerodynamics," thing? Take a second look and tell me what you see in the Scarab. That's right. It's super swoopy and aerodynamic. He wasn't just one of the biggest names in the custom car world. Well, 472CID said it best. Ed "Big Daddy" Roth [gave] us the closest things to Jestson cars. And look at this face and tell me he isn't nuts. It's easy to remember Sbarro as the guy that pioneered the hubless wheel. It's easy to remember him as the guy who penned possibly the ugliest car ever made. It's easy to remember him as the guy who built six-wheel-drive offroaders designed specifically for falcon hunting. But then you just have to look at one picture of him in his jumpsuit leisure wear and his idea of every day transportation (pictured above) and you'll see that the Swiss sports car designer was nuts. He doesn't just make cars — he makes space ships. And he wants to shoot people from San Francisco to Los Angeles through a giant rail gun at something around 600 miles an hour. What more do you need to know? Must throw Musk into the mix...opps hes not from the Wild West Days! Paul Moller works in my home town of hippy-dippy Davis, California. 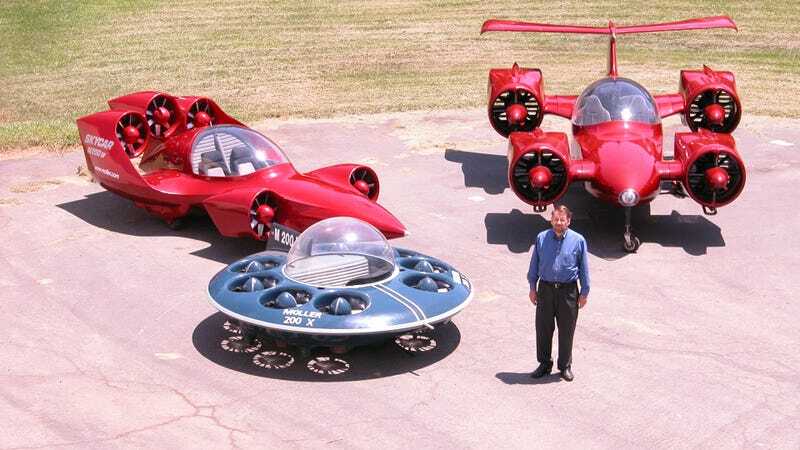 Growing up, everyone used to laugh about Paul Moller, because he's been trying (unsuccessfully) to build flying cars for the past forty years. He even tried his hand at making a flying saucer. You have to be kind of crazy to invent a new kind of combustion engine, but designing the rotary is not the only reason why Felix Wankel was nuts. He was such a militaristic fascist, the Nazis arrested him and kicked him out of their party not once, but twice for being too enthusiastic. Seriously. You have to be extra crazy to be too crazy for the Nazis. You might not have heard about C. Eugene Middlebrooks, but his Florida-based company Turbonique was as close as the world has come to a real, live version of ACME. Turbonique's famous creation was the 'Turbonique Drag Axle,' which was basically a rocket that you strapped onto the back axle of your drag racing car. Yes, this was a company that sold the public rockets that you strapped on for extra boost. Obviously it was started in the '60s and obviously the whole thing was eventually shut down over safety concerns. No roadrunners were harmed in the making of Turbonique. There's no question that Henry Ford was a modern genius. The problem was that Ford was very aware that he was a genius, and possibly obsessed about it, too. He pioneered modern assembly line and factory production, but he doggedly stuck to obsolete tech he was infatuated with, often split his engineers into secret teams and had them compete against each other, and he also hounded his son, probably to an early grave. He was so sure that his way was the right way, he built his own utopian factory city in Brazil. Ford will always remain a legend, but the man wasn't all right in the head. You have to be pretty insane if you get a medal from the Nazis, right?